Serverless backup does not consume the resources from a main server for backup and restoration activity. Handy Backup allows serverless disk-to-disk backup by using either computers other the main server to operate, or by operating directly from a dedicated storage server. By using serverless backup, you can both save some traffic for a main server unit in your system and also free some computing and storage resources on that main server. Instead, you will load a burden of backup activity to other computers in your network. With serverless backup, you have no need to worry about server activities that can conflict with backup and recovery. Let your server work as usual, while another computer will take a serverless backup task according to Handy Backup scheduling by an exact time or by a system event. Good serverless backup systems can operate from storage servers. 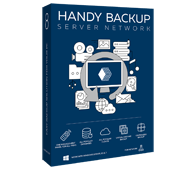 To realize that requirement, Handy Backup provides a solution to use with all modern versions of Windows, with Ubuntu 16.04 and 14.04 LTS Linux releases and their clones, as well as allows organizing serverless backup to cloud. This instruction describes how to utilize network-oriented editions of Handy Backup for serverless disk-to-disk backup in a local network. Download and install a Handy Backup Management Panel onto some local machine other than the main server in your network. Next, download and install some Network Agents (either Server or Workstation editions, according to the purposes of your machines) to other computers in your network. Connect your Network Agents with a server, as dexcribed in the User Manual. You can also install the pre-configured Network Agents onto your machines. Now it is time to create your first serverless backup task. We are creating a local serverless disk-to-disk backup task here; in other cases, you can backup to FTP or to a cloud (such as making Amazon S3 backup). 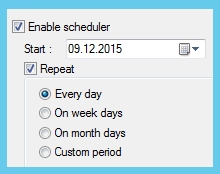 Open the Management Panel and create a new task by a button. Select a backup task on the Step 1 and go to the Step 2. On this step, select a machine from the drop-down list in the upper left corner. Then use the “Computer” plug-in to find the content of this machine that you will save. Go to the Step 3. Again, select another machine to use its disk as backup storage. By using the “Computer” plug-in, choose a place to store your backup. 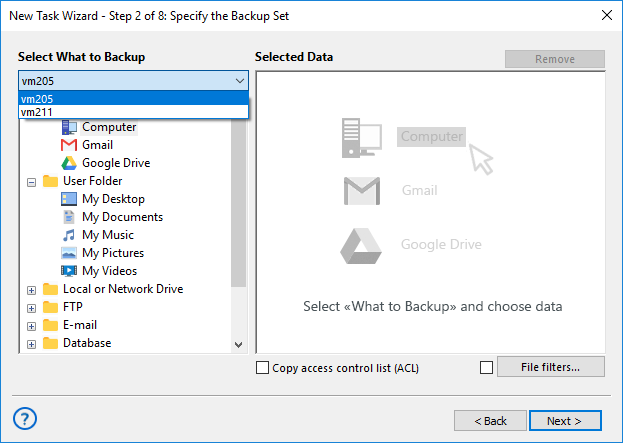 On the steps 4-7, you can make any advanced backup task settings that you feel appropriate: partial backup, time-stamping, encryption and compression, scheduling your task and so on. On the final step, give your task a name and mark a checkbox (if you want) to run this task immediately. Well done! The serverless backup task that you created will work according to its schedule, or when you will run it manually at any time. You have need for no more actions to perform the serverless backup! The ultimate network-oriented edition, Server Network allows serverless backup from and to any type of machines in a local network of any complexity.